CALGARY — Mark Giordano had two goals and an assist in career game No. 800 to lead the Calgary Flames to a 7-1 win over the Arizona Coyotes on Sunday. The Flames captain is up to 47 points (9 goals, 38 assists) in 45 games on the season, putting him second among NHL defencemen and five points behind leader Brent Burns. Matthew Tkachuk with a pair, Sean Monahan, Johnny Gaudreau and Sam Bennett also scored for Calgary (30-13-4). The Flames have won five straight and are 8-1-1 in their last 10. They are second overall and lead the Pacific Division by three points over the San Jose Sharks. Gaudreau also had an assist and extended his point streak to eight games (8 goals, 10 assists). With 69 points on the season, he moved into second place in league scoring, six back of Nikita Kucherov. Jordan Oesterle scored the lone goal for Arizona (20-22-3) as the Coyotes’ three-game winning streak came to an end. Relegated to back-up duty lately behind the red-hot David Rittich, Mike Smith got the start for Calgary and made 22 saves to improve to 13-9-1. Adin Hill went the distance for the Coyotes, finishing with 19 stops. He fell to 7-5-0. It was a good outing for Smith, who had struggled early in recent games. With the score 0-0 in the first, he slid across the crease to make an acrobatic stop on Derek Stepan. Calgary surged in front 2-0 on goals 68 seconds apart late in the first period. Then Monahan was left alone in the slot and he converted Gaudreau’s pass from behind the net. After Tkachuk’s goal 1:36 into the second period, Gaudreau scored at 17:20 to make it 4-0. Michael Frolik’s shot was stopped, but Monahan slid the rebound over to Gaudreau and he was left with an empty net. Oesterle’s power-play goal at 19:44 gave Arizona a glimmer of life heading into the third period, but that was erased when Tkachuk scored his second at 4:20 and less than two minutes later, Giordano added his second. Notes: Calgary defenceman Travis Hamonic (family illness) was a late scratch. 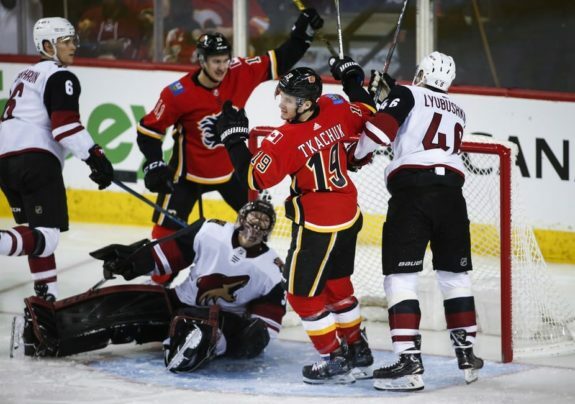 He was replaced by Dalton Prout… Arizona’s Conor Garland had his four-game goal-scoring streak snapped… The Flames improve to 22-3-0 when they score first… Calgary has a league-best plus-38 goal differential in the third period.